This is not an official park trail but rather follows the old Mile Wide Road to the Mile wide Mine. 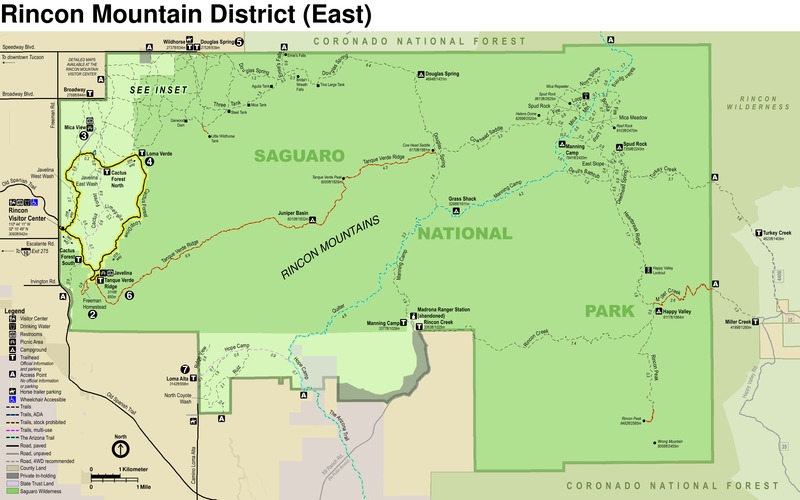 The mine is located along the western tributary of the King Canyon Wash with Amole Peak to the North. 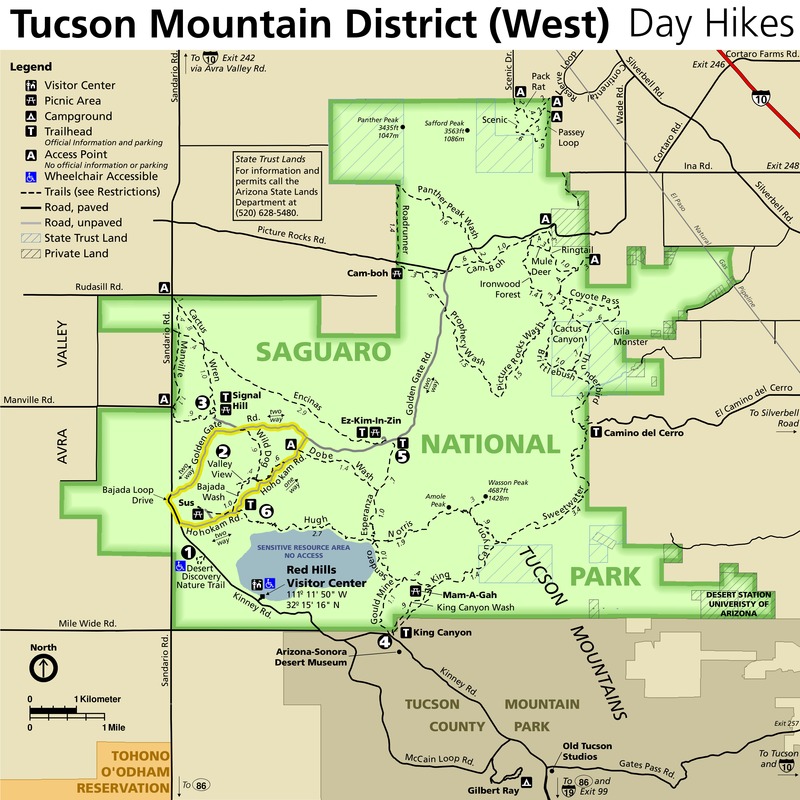 This is one of the four relatively successful mines in the Tucson Mountains (1915 to 1920), the other three being the Gould, Yuma and Gila Monster Mines. The Copper King Mine became known as the Mile Wide Mine when Charles Reiniger established the Mile Wide Copper Company. Charles Reiniger’s claim was a mile wide and hence the name. On this site was a work shop, Mess house, Rock Crusher and a Mill. The Mile Wide Mine has a history as colorful as the mine tailings. Charles Reiniger over sold the mine to investors and in 1919 he disappeared with stockholder money and sold off $100,000 of his own stock before leaving. 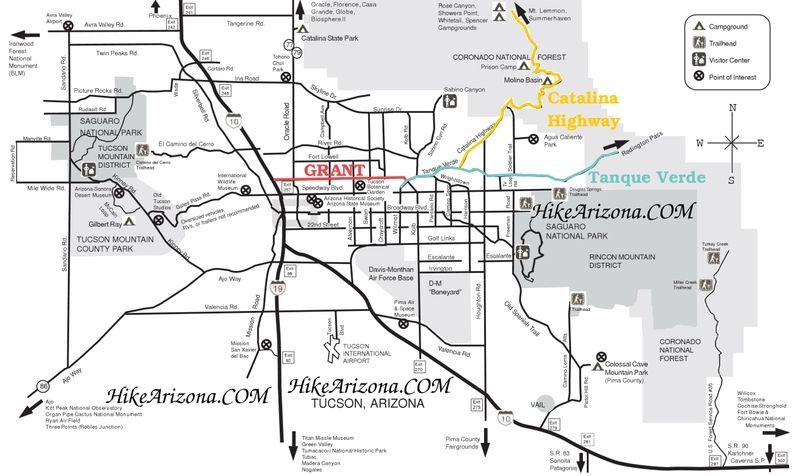 The trail head for this hike is on Kinney Road at the King Canyon Trail Head. 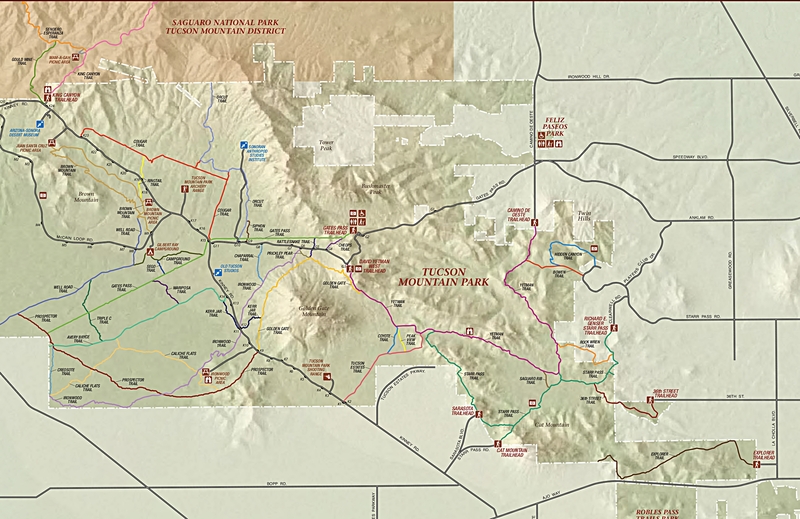 Take the King Canyon Trail for 0.9 miles to King Canyon Wash at the junction with the Sendero Esperanza Trail. From this junction the route heads due north along the old mining road for 0.6 miles to the mine. This road is almost nonexistent at the junction of the two trails but traces of it are still visible. 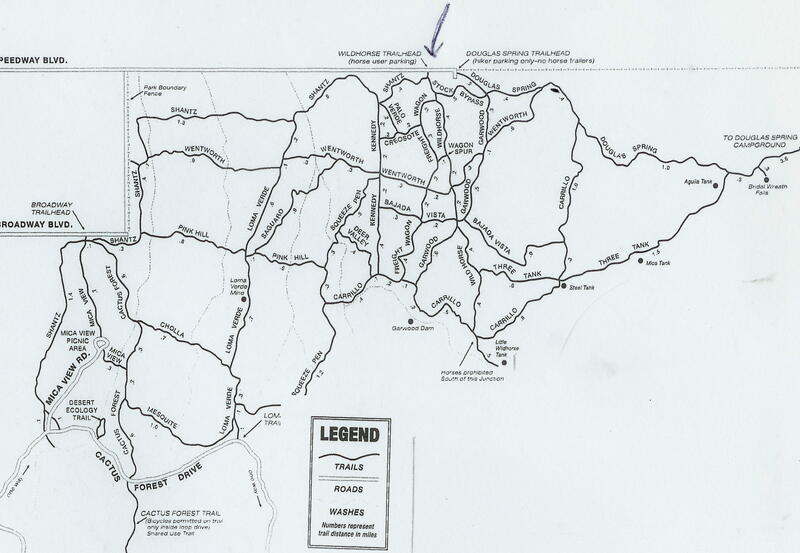 There is also a vague trail that follows this road from others who have visited the mine site. Once past the trail junction the road becomes more obvious. This trail is rocky and in places overgrown with cactus or brush but I don’t believe requires much trail finding skills. Along this road are rock walls built to support the road and in one spot there must have been a bridge to cross a small wash. Once at the mine you just kind of wonder around, Mine tailings with lots of color and minerals, Trash pile with hundreds of condensed milk cans, a very large Mine shaft and a cement platform for some mine related structure above the shaft. The mine shaft is fenced off to keep people out but I can see where some have gone under the barbed wire fence for a closer view. I didn’t go any closer than the fence that is only a few feet from the shaft, it looked pretty scary from the fence. 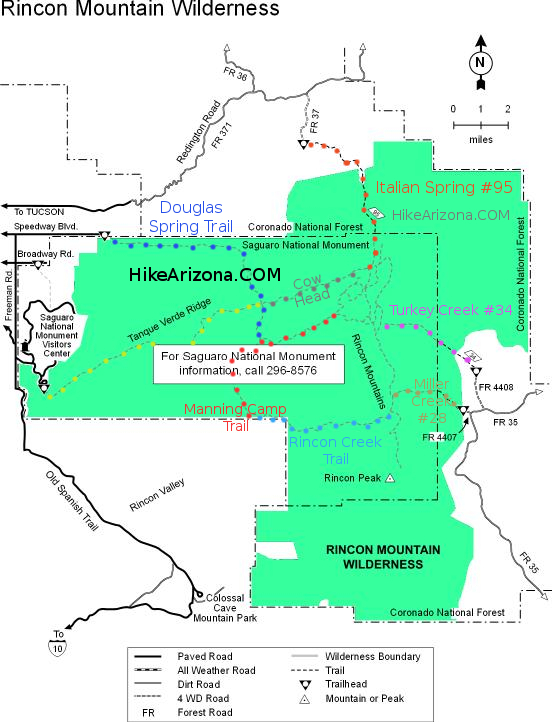 This short hike is well worth the trip especially if you are into old mines and history. I wonder what they did with all that condensed milk; there must have been 500 cans of it in the two trash piles. If you do visit this site leave things as you found them for others to enjoy and don’t do something dumb and get injured, that’s the fastest way to have this area officially shut down. Trail Head is at the signed King Canyon Trail Head along Kinney Road just north of the desert Museum.